After exploring some more variations of this buttonhole bar, the stitch sampler was completed. 4.Horizontal bars are worked in these two samples. 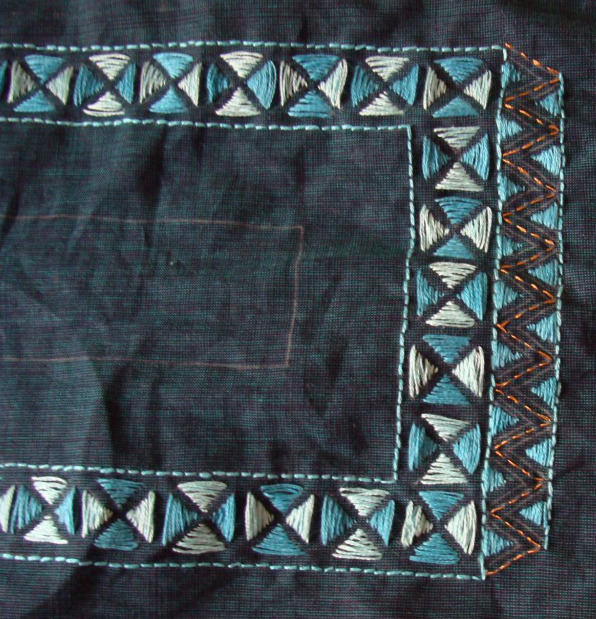 The two rows buttonhole stitches are worked upwards and downwards alternatively in the first sample. In the second sample horizontal buttonhole bars in the bottom row are worked in between two buttonhole bars in the top row. 5.The bars worked at two levels in the first sample and vertical and horizontal bars are alternated in the second sample. 6.Broad version of the bars [three and four straight stitches] are worked in the first sample. I tried the triple straight stitches in different ways and worked the buttonhole stitches on them. 7.In the first sample, the buttonhole stitch in the centre is extended and taken with the base fabric, to work curved buttonhole bars. 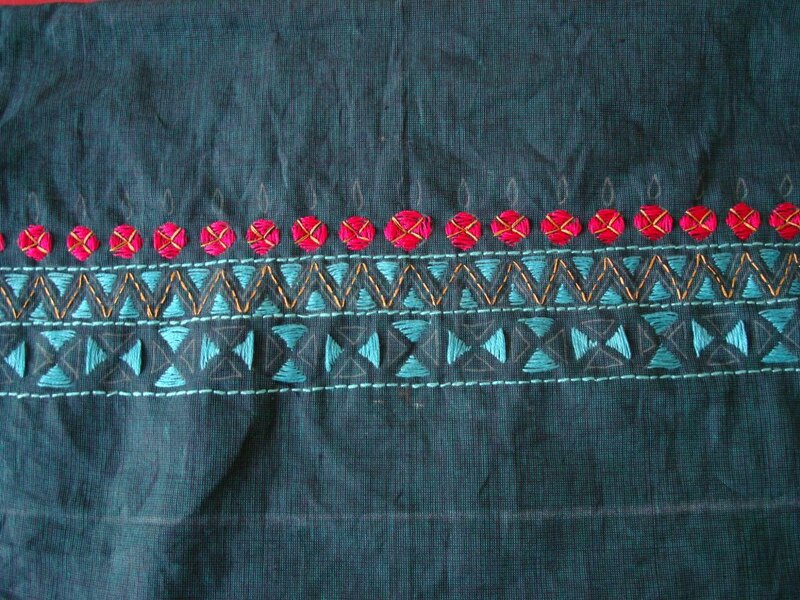 A small knot is worked in the centre of the horizontal bars on the top sample in the right, and detached buttonhole stitches are worked on the bars worked on the bottom. I did not work these bars with other stitches in this sampler. These bars are ideal for embellishing any embroidery piece. 1.In the first sample, the bands are worked apart, then they are worked closer. In the next sample, they are worked in two heights and the last one is worked in two colours. 2.Another way of working with two threads is tried in the first sample. The buttonhole stitches are worked on the lower half of the straight stitches. 3.In the first sample, the buttonhole stitches are worked in one direction till the midpoint of the straight stitches and in opposite direction till the end of the stitches, thus to create a twist, which would have been visible if the straight stitches were longer. The second sample hve up and down buttonhole stitches worked on them. 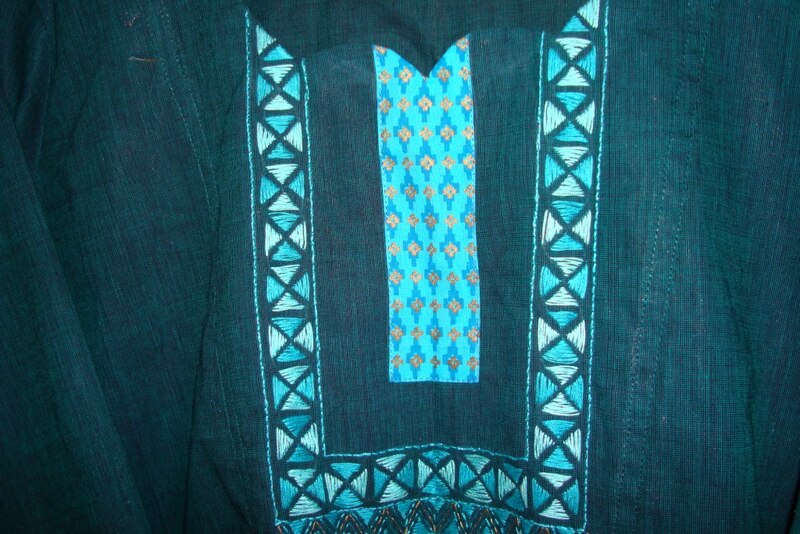 This tunic also as a motif below the yoke borders. The motif worked with medium blue, dull gold and white threads. 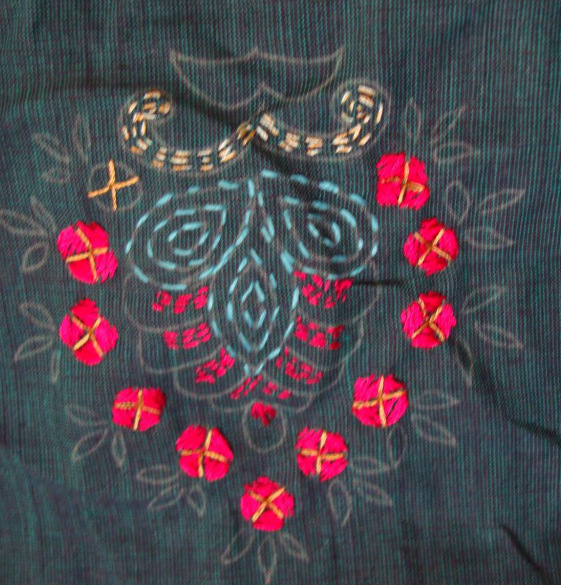 The motif looked like this after working with dark pink thread. Some more running stitch filling and stem stitch outlines were done with medium blue and light blue threads. 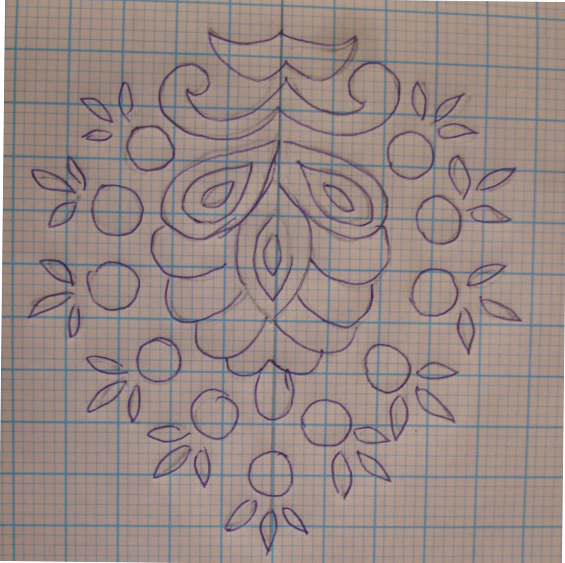 The motif, after working the antique gold beads inside stem stitches. 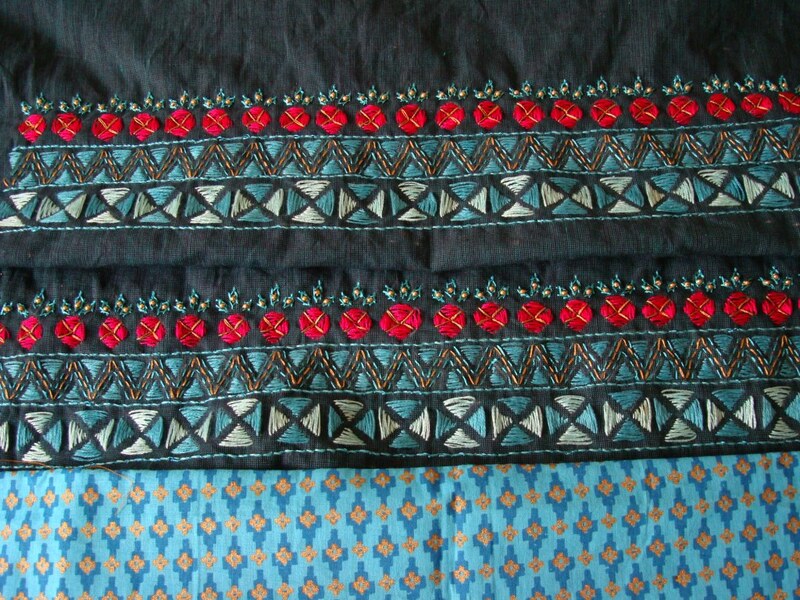 The sleeves with printed border. 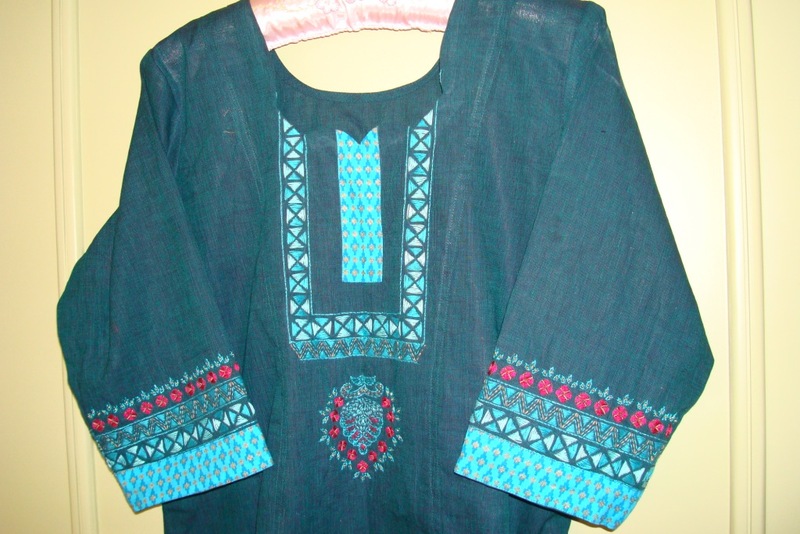 I wear this tunic with light blue [same shade as the printed fabric base] leggings. I do tend to work with these colours quite often! The pattern for yoke was similar to the sleeves, except for the dark pink details. Filling done on part of the squares. 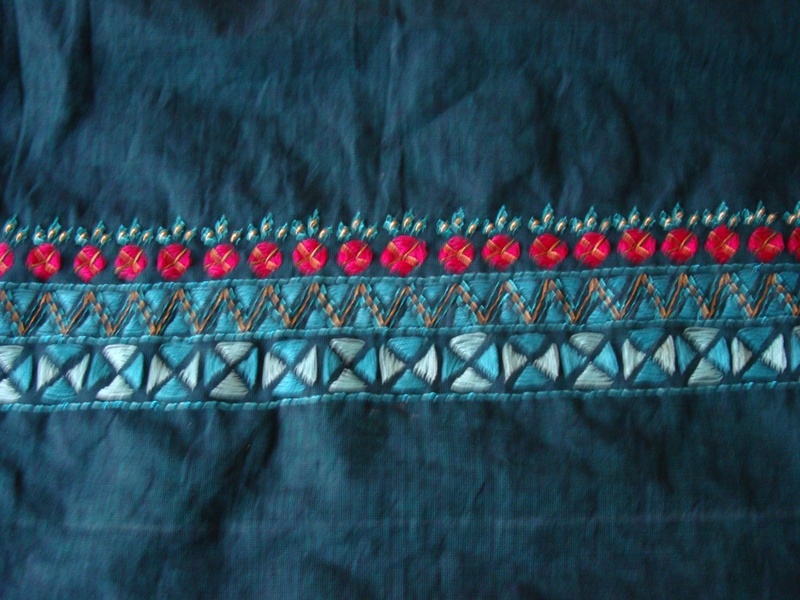 Triangles on the border worked with the same blue thread. After working with light blue thread and dull gold thread. The centre space is for the printed light blue fabric. The crosses done with dull gold cotton skein were worked with running stitch filling in dark pink thread. 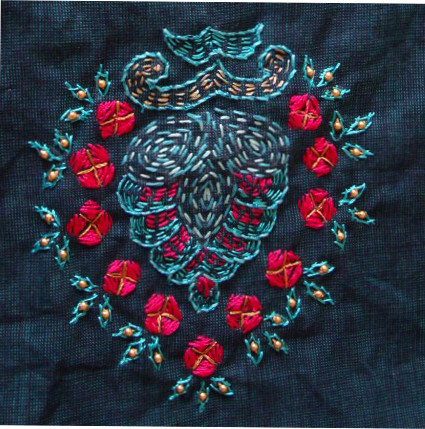 The medium shade blue thread was used for lining the oval shapes over the dark pink circles. These were worked in stem stitch. 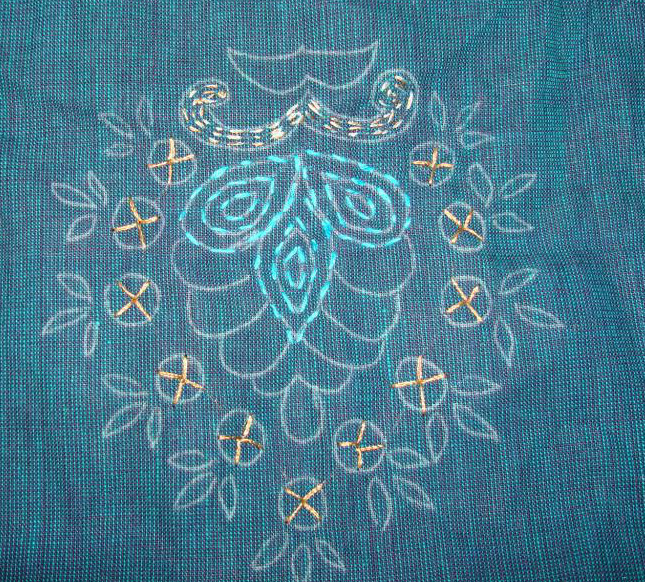 light blue thread was worked on other part of the triangles on the squares and the border lines. Tiny antique beads were added inside the oval shapes. The picture is out of focus here. 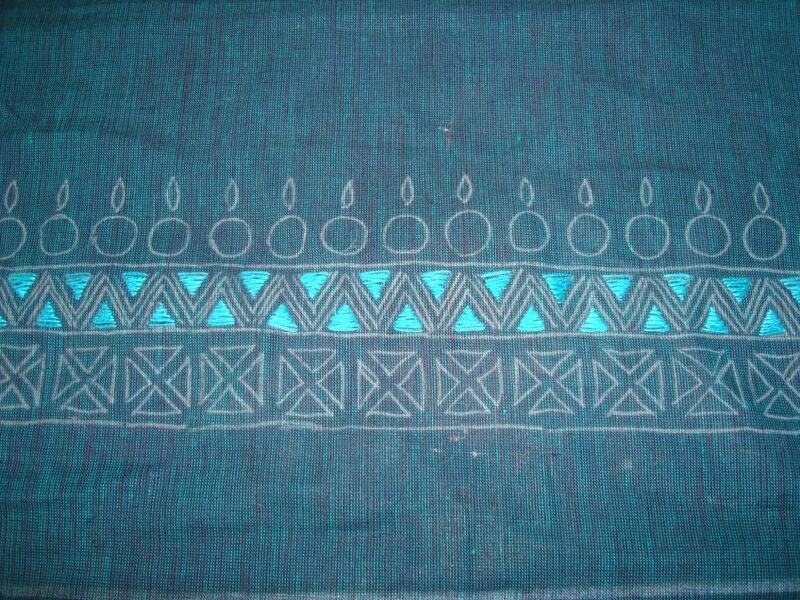 After completing the embroidery on the sleeves, they were placed on the printed light blue fabric which will the border the sleeves. 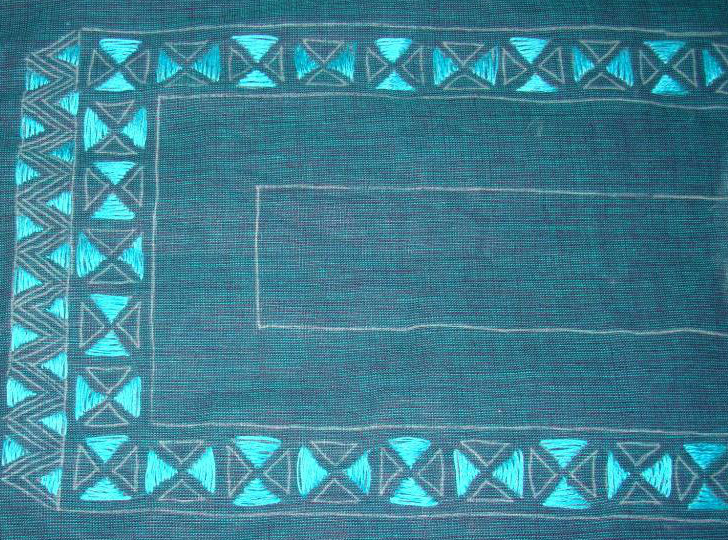 I was inspired by tunics embellished by simple Kantha embroidery of Bengal. 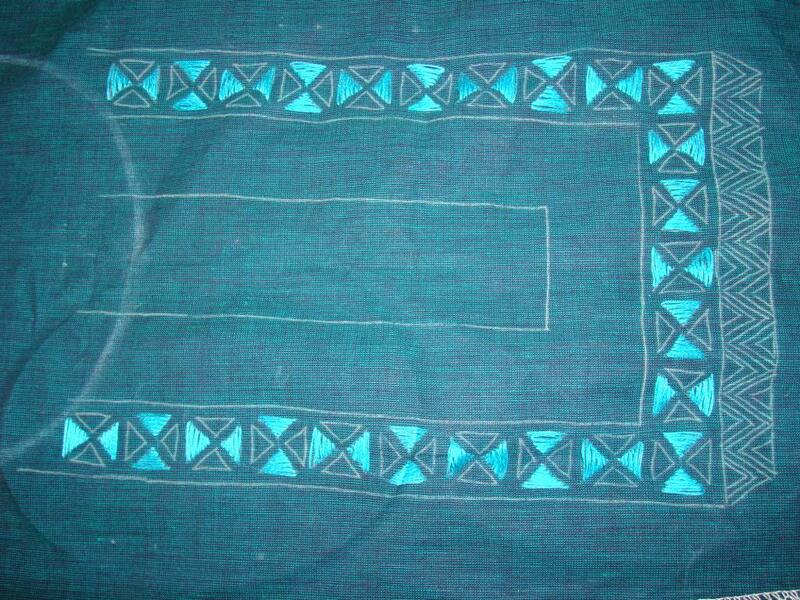 This embroidery was done mainly on sleeves and front of the tunic. 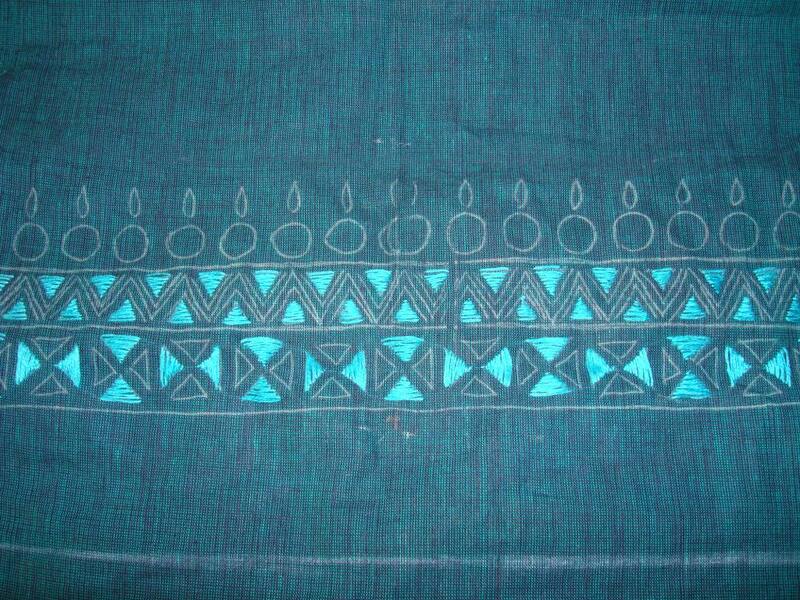 The chosen tunic fabric was dark blue striped Mangalagiri handloom cotton. 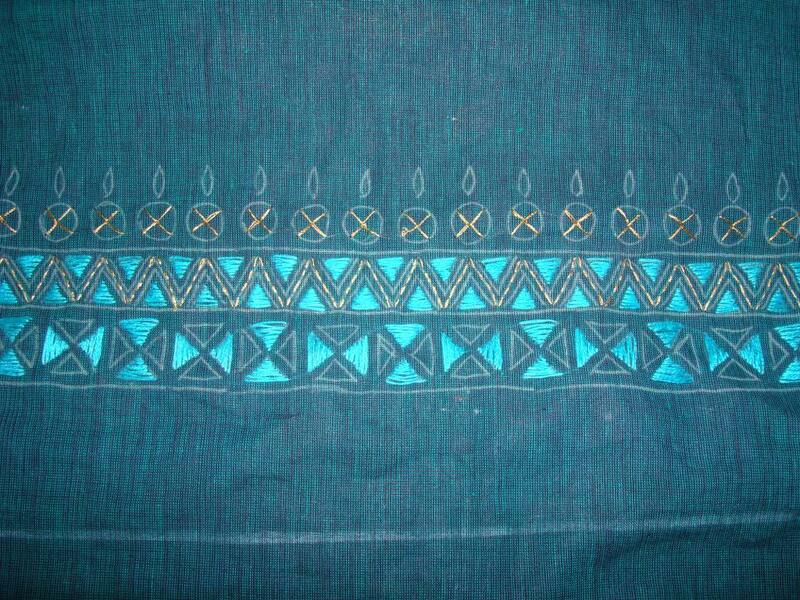 I had this block printed light blue fabric, which I used for the sleeve border and yoke. 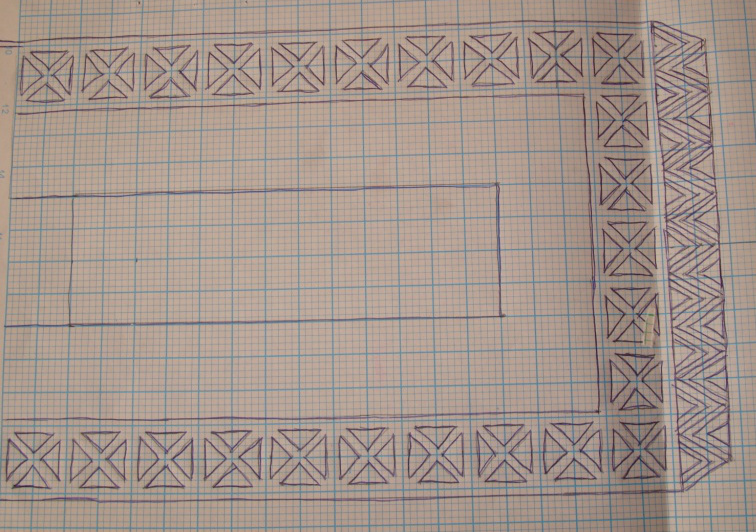 A geometrical border was drawn on graph sheet. Today some stitch combinations were worked on this sampler. 5.These stitch samples are combination of top knotted buttonhole stitches with- buttonhole stitch, closed buttonhole stitch, crossed buttonhole stitch and basque stitch. 6.In the first sample, after working sheaf stitch , the top knotted buttonhole stitches are looped through them in Pekinese stitch style. 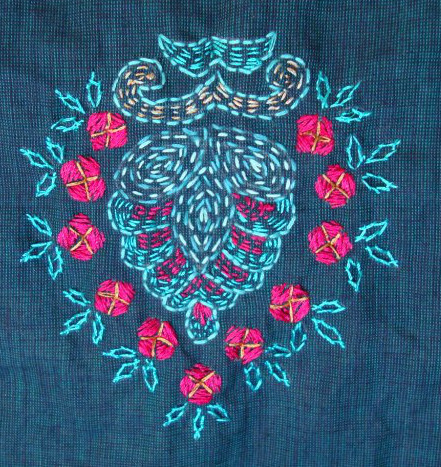 Arrowhead stitches are worked below the knots in the second sample. 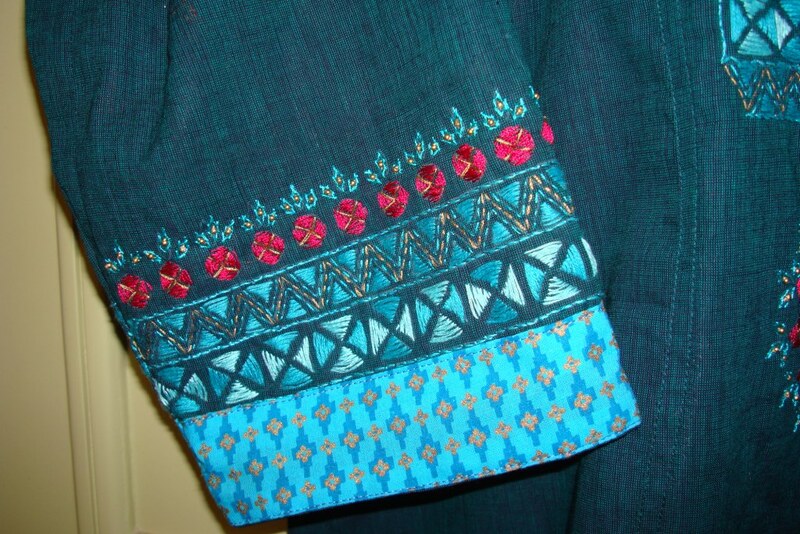 Top knotted buttonhole stitch is whipped and Italian border stitches are worked between the knots in the last sample. This stitch looks quite decorative by itself, combining it with other stitches gives scope to explore this stitch. I happy that I learnt this lovely stitch. As Queenie patch mentioned it looks like Thai script. In our country, some eastern languages like, Bengali, Oriya and Assamese script also look like this but with more curves.